One thing to note: after it’s installed, it still doesn’t do anything until you set the preferences. So don’t forget to do that. Publish: Add some text beside indecipherable Upload Button. Publish: Change or remove the Submit/Update button. Publish: Change or remove the Quick Save button. Publish: Change or remove the Preview button. Publish: Add a tiny link beside the URL Title to view the current entry on the live site. Publish: Make the “Email” toolbar button better behaved: Leave out the title when it ought to. Publish: Remove the image button you’ve never used from the toolbar. 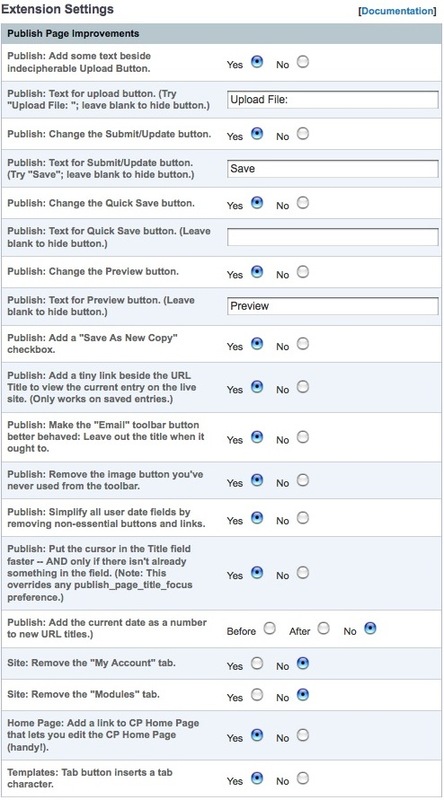 Publish: Simplify all user date fields by removing non-essential buttons and links. Publish: Put the cursor in the Title field faster—AND only if there isn’t already something in the field. Publish: Add the current date as a number to new URL titles. This is handy for Google News usage. Site: Remove the “My Account” tab. Site: Remove the “Modules” tab. Home Page: Add a link to CP Home Page that lets you edit the CP Home Page (handy!). Templates: Tab button inserts a tab character like you expect—makes it way easier to edit templates.